The journey was full of excitement, giggles, a little taste of hell and just plain ole fun. Watching Cardcaptor Sakura made me feel like a little girl again, one who has just discovered her deep love for the crazy, unrestricted worlds of anime. I can easily see why it was such a massive hit that’s still beloved nowadays. You can now consider this writer a charmed, avid fan as well. One of my most pleasant surprises was how well most of the show still holds up. Helmed by director Morio Asaka (now renowned for his many shojo adaptations, like Chihayafuru), there’s an incredible amount of artistry involved. Takayuki Negishi’s score feels both magical and infinitely charming. After their stunning color design on Land of the Lustrous, I’m also a new fan of the art director Osamu Mikasa. The series favors bright color palettes, generally maintaining a soft aesthetic that still works when it goes for the mystic or the unsettling (they sure love dutch angles). The animation can sometimes be limited (lips sometimes aren’t fully synched with dialogue) but it’s rarely, if ever, really noticeable. Overall it keeps some good levels of fluidity and camera motion, and it shines the most in important dreams and action sequences. The premise it’s simple enough: After Sakura Kinomoto finds a magical book on her house’s library, she has to collect the Clow Cards she accidentally scattered. Throughout its 70 episode run, the series inclines most towards cheerfulness, complemented by healthy doses of mysteries and threats. With that being said, if you revisit the series without remembering much (or are a first timer), some questions will have satisfying paid-offs. However, it does indulge in some mysteries that might have been resolved earlier had some of our heroes just paid a little more attention. It can’t be denied that the show doesn’t care much for innovation in its story either: it mostly relies on a “card of the week” format, even if there’s generally something lurking in the background that will later connect everything. With each new season, names and colors might change, but the basic structure just repeats itself. Still, by the end of the first season, I was so invested that I just couldn’t care less. That doesn’t mean that the episodic format is in any way bad. Having episodes focusing on a single card sometimes lead to some very goofy ones for light watching, but it also produced some very worthwhile individual stories. At its heart, Cardcaptor Sakura is as welcoming and hopeful as its protagonist. It doesn’t lack physical-magical fights, but big conflicts are ultimately resolved both with empathy and believing in yourself and others. I can easily see how Sakura it’s such an inspiring role model: she’s an example of love, tolerance and acceptance, which also makes her an agent of change. Her nature not only resolves conflicts, but also inspires the development of other characters, like Meiling or Syaoran. 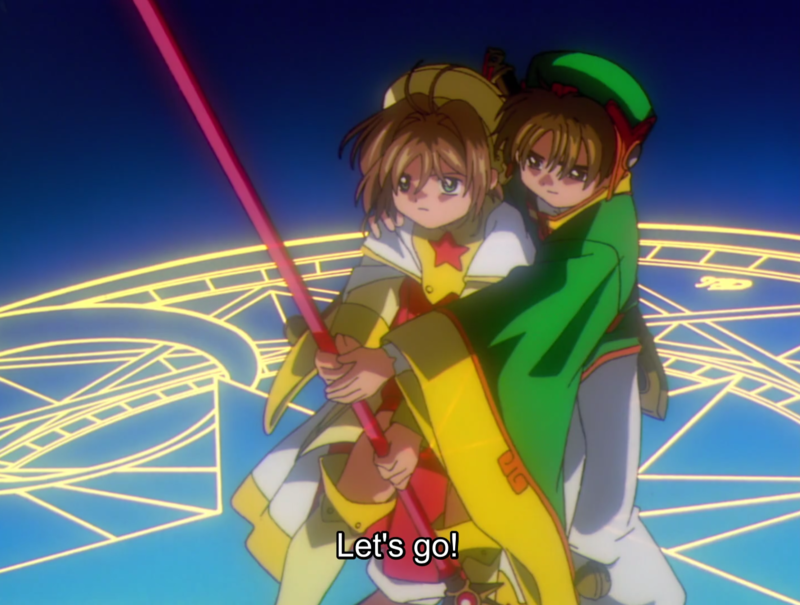 Both started with different levels of hostility towards her, but eventually ended up warming up and –especially in Syaoran’s case– even loving her. Her influence it’s most notable in Syaoran, who I enjoyed watching slowly go from “mean little brat” to relatable awkward mess, when he finally reveals the true sweetness of his character. Besides these two, Sakura has her best friend Tomoyo and her guide Kerberos (who they call Kero-chan) by her side, and both are a delight. Perceptive, classy, fashion fanatic and aspiring filmmaker, Tomoyo is nothing but Goals. And the glutton, game obsessed and genuinely caring Kero is easily the most relatable character of the whole damn show, rivaled only by Syaoran’s extremely awkward way of handling his crushes. Other Sakura’s friends and classmates are recurring characters that are mostly unremarkable, but can sometimes contribute to conflicts or comedic parts. We also have her widowed father, who I would absolutely adore if it weren’t for one thing (I’ll get into this later), and the good boys: Toya and Yukito. Toya –who has his own magical powers– starts as the mean old brother but as the series progresses, he steadily becomes a likable, interesting character in his own right. I have to confess that good boys (and girls) are my weakness, so naturally, I’m nothing but putty in Yukito’s hands. He is sincerely gentle, perceptive and full of easy smiles. I never stood a chance. Whether it’s friendship, filial or romantic, love plays a big part in Sakura’s world. Some of those relationships are wonderful. Others, like some of the straight romances, feature problematic content like the infamous teacher-student relationships. I especially liked the family dynamics in the Kinomoto’s household. They take turns with the house chores and everyone helps. Not only that, everyone wants to help, and it’s notable just how much they care for all the members of the family. Even with the common brother-sister banter happening practically every morning, it’s mostly a peaceful, loving home. Tomoyo and Sakura have a close, extremely loving and supportive friendship, and the relationship both girls have with Kero has made me giggle perhaps too many times. The main romance between Sakura and Syaoran receives a satisfying development and a not so satisfying ending (good thing we have a sequel!). Basically, they go from “rivals” to good, supportive friends to wholesome dorks in love. They do nothing but warm my heart, bless them. Like many other classic shojo, Cardcaptor Sakura has queer characters. The way they’re handled, although way better than in other works, still varies. At its worst, we have Tomoyo’s plight, which it’s never really treated as such. 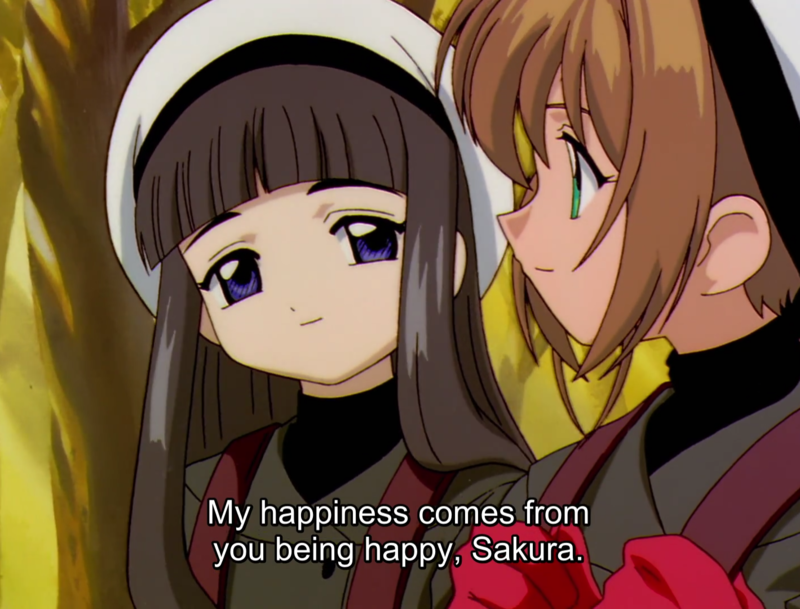 Tomoyo is in love with Sakura, but she’s perfectly content, satisfied even, with whatever she can get. It’s never even insinuated that she could ever try to confess, much less compete for Sakura’s affection. She’s also the one who actively encourages Syaoran to confess to Sakura. Sure, much can be said about Tomoyo’s kindness and selflessness, her budding relationship with Syaoran and how no one it’s obliged to like her back. Still, I can’t just ignore how both her conformity and her role encouraging the main couple plays well into a narrative that’s ultimately meant to dismiss her feelings. We also see Syaoran and –to a lesser extend– Sakura getting all blushy not only for the opposite gender, but for their own as well. This is most prominently seen in Syaoran’s crush for Yukito, which is treated no differently from Sakura’s crush by other members of the cast, especially Sakura herself. However, when the time comes for Sakura and Syaoran to move on towards their romance, things… change a little. While Sakura’s crush was resolved with certain levels of respect and empathy, Syaoran’s was ultimately explained away as “magic.” Sakura was given time and space to recover from her heartbreak; Syaoran was immediately okay with it. Still, even though I’m aware of those flaws, I have to say that Cardcaptor Sakura incorporating queerness that’s generally readily accepted in-world is very heartwarming. And at its best, we have the absolute beauty that is Toya and Yukito’s relationship. Toya and Yukito are introduced as very good friends and classmates. But as the series goes on, it becomes increasingly clear that there’s a lot more going on between those two: insinuations that they like each other are present both in subtext and in very textual scenes. They are always together, and with their dynamic, you can tell just how close and open they are with each other. Their moments of playfulness, or those of pure tenderness, were simply too much for this writer’s heart. The good boys are good, folks. Can wait to see more of them in the sequel. 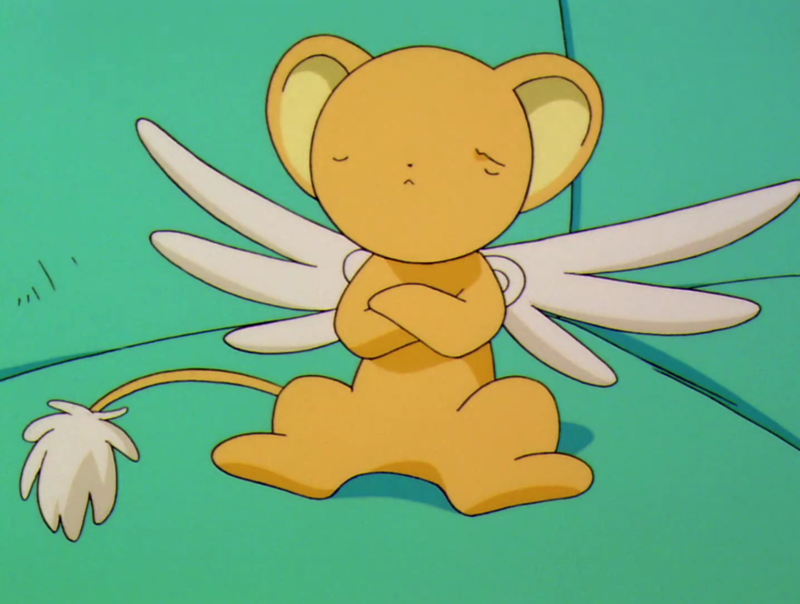 I would fight for Cardcaptor Sakura, but I believe it’s also necessary to discuss both the uncomfortable and the undoubtedly problematic content. Even though they’re still kids and it can be argued that things are innocent enough, I wasn’t crazy about Meiling being framed as a potential romantic interest for Syaoran despite being cousins (just to be clear, we’re talking blood-related, grew up together here). We have an episode where Sakura meets her great-grandpa, which just… haven’t aged well. Sure, it involves wholesome stuff like drinking tea and playing tennis, but Sakura doesn’t know his identity at first. From her perspective, she just passes the day alone in a strange old man’s house, who at some point takes her to his dead granddaughter’s room and ask her to wear her clothes. None of this had to be creepy, considering they’re family and the great-grandpa knows this from the beginning (I believe), but the episode’s execution can sure give off some bad vibes. There’s also Eriol, a child of Sakura’s age and an important player in the final arc. He’s the reincarnation of Clow Reed, the Clow Cards creator, and he maintains most of his previous life’s memories. However, it’s something that goes largely unexplored, which made Eriol feel like Clow Reed –a grown man– in a child’s body rather than his own individual. This made it weird, a little unsettling even, to see him framed as Syaoran’s potential romantic rival and Sakura’s magical nurturer practically in the same breath. After being introduced in this way, the feeling doesn’t completely go away even when the former angle it’s dropped and the later gets more focus. What I’m about to discuss can certainly put a damper on a series that’s otherwise wholesome adventures for all ages. It thankfully isn’t prominent, but it’s still a serious test of tolerance, which I generally don’t lack. But this is just too skeevy, especially when we take the intended demographic into consideration. There are no less than three teacher-student relationships on this show, two involving teenagers –Sakura’s mother and Sakura’s older brother– and one involving an actual elementary schooler. I’ve heard that there’s not as much of the latter in the original anime as in the manga. Still, the set-up of the concept alone (episode 8) brings discomfort strong enough to fuel a couple of nightmares, which is only made worse by a follow-up episode meant to portray little Rika as “very mature” for her age (episode 9). All interactions between them, even if scarce, left me feeling deep concern and a strong urge to see some cops getting involved. No one it’s ever arrested, but we always have fanfics. After completing this journey, I can sincerely say that I consider Cardcaptor Sakura well deserving of its status as a classic. It has some serious caveats, but if you can stomach them, the good aspects are enough to make this series worth it. Although its main demographic are little girls, the series has something to appeal to all ages: It’s full of lovable characters, it has some very compelling relationships and when it’s not being touching, it’s simply lots of fun. The production values hold up quite amazingly as well. The length and the limited but very problematic aspects make me hesitate to recommend it to any casual viewer, but I would definitely recommend it to someone who’s already into anime, or someone who wishes to relive some childhood memories. And of course, it’s a must-watch for any shojo and magical girls fan. Kero-chan’s eternal quest for good food. Syaoran being awkward with his crushes and literally running away from his feelings. I lost count of how many times he did that, but it never got old. Everything involving Yukito and Yue (Megumi Ogata performance it’s such a nice bonus). Kero-chan’s transformation scene (I’m all about those colors and sparkles). Sakura’s magic circle symbols: Moon (Yue), Sun (Kerberos) and Stars, her own power. Sakura getting strong enough to create her own cards using her own magic. The fact that Sakura doesn’t have a magical girl transformation and actually has to take the time to change before going to battle. It cracks me up every time I think about it. Although Tomoyo herself always dressed well, her designs for Sakura are hit or miss for me. Still, I enjoyed them all, some because they looked good, others because they made me giggle a lot. Sakura and Syaoran being extremely alike in some ways, like in who they crush on (they’re both disasters bi and I won’t hear otherwise). Meiling vs random park’s objects. Sakura’s dream sequence activated by the dream card, which was a premonition to the final judgment. The on-going joke of Toya randomly popping up because he works everywhere. The manifestations of Toya’s powers. Sakura and Yukito being supportive of each other’s love lives. Good kids y’all. The light and dark cards. Most of the cards designs, really. Found your blog while searching for some CCS reviews since I’m rewatching it for maybe the 929th time! Loved your post, it’s so refreshing to see someone so addicted to it as I still am. Man, this anime is all about the FEELS. I’m on episode 19 and already dying.